Poetic moments seem to happen randomly. You never know when the muses might rest on you and shift your mind into the state of poetic reflection. It can happen around the most seemingly common events. This was one of them. It happened on the morning of Feb. 27, 2011 when I was amazed by a spider on my bathroom wall. Well, I can only tell you I was sitting down. This morning I saw a spider. I watched it as I sat on my throne. 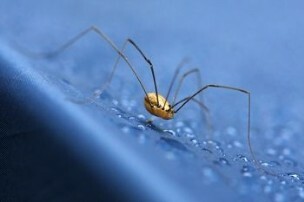 It had 8 dandy long legs and it walked up the bathroom wall. I could have touched it, even killed it … since I’m in-charge of Elohim’s domain. But no … it was too pretty so I gave it a reprieve. Then I saw two of its legs wailing in the air; the others held fast. “What is it doing?” I looked on with intent. The spider was fishing in the air and it caught something, I couldn’t see. But then, it began to climb in the air using all of its limbs. It was on a strand of its own thread, stuck high somewhere on the ceiling. Only the spider knew where. It climbed, ever so gracefully. How could it fight gravity with such ease? This morning I saw a spider! ATI means "all that is."